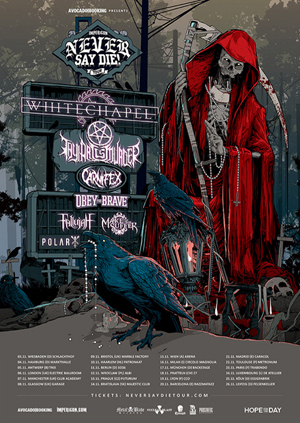 After recently completing a co-headlining USA trek with SUICIDE SILENCE, WHITECHAPEL is now ready to fly over to Europe to kick-off the Impericon "Never Say Die!" 2016 tour, which will see the band headline a 3-week-plus-run through 13 countries. With just one week until the first show, WHITECHAPEL is now premiering their new video for "Bring Me Home" today. Check it out now on KNAC.COM right HERE. Front-man Phil Bozeman comments: "This video means more to me than any video we've ever done. It portrays my struggle through dealing with my dad's death at the age of 10. The shots of me show me at my darkest moments. Suicidal thoughts, suicide note and feeling alone. The atmosphere of the room we shot this is nailed exactly how I was feeling at the time. Dark, depressed and suicidal. The shots of the man and young boy portray my bond I had with my dad and how devastated I was when he left. They are presented to be in a dream like state of me remembering him. The last shot is from my dad and mom's actual gravesite. It's really awesome to have that authenticity to the video. The final scene is showing that I came out of it alive but no matter what, I will push forward and not give up." Regarding the upcoming European tour, guitarist Alex Wade adds: "We are excited to return to Europe shortly with our new record and headline "Never Say Die!" 2016. We love Impericon and the "Never Say Die!" Tour, so we've been looking forward to this since it was offered to us. The line-up is solid and heavy so don't miss this tour!"